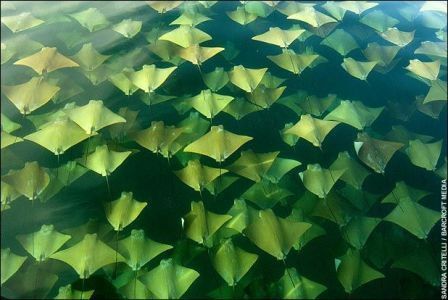 Mass Migration of Stingrays: Looking like giant leaves floating in the sea, thousands of Golden Rays are seen here gathering off the coast of <?xml:namespace prefix = st1 ns = "urn:schemas-microsoft-com:office:smarttags" />Mexico . 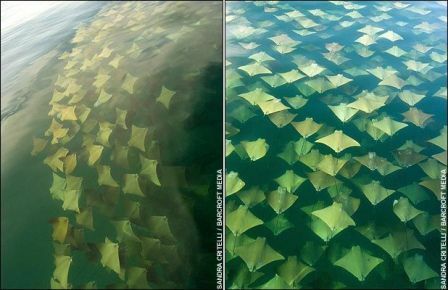 The spectacular scene was captured as the magnificent creatures made one of their biannual mass migrations to more agreeable waters. 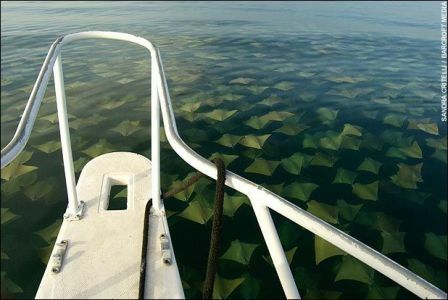 Gliding silently beneath the waves, they turned vast areas of blue water to gold off the northern tip of the YucatanPeninsula . Sandra Critelli, an amateur photographer, stumbled across the phenomenon while looking for whale sharks. She said, "It was an unreal image, very difficult to describe. The surface of the water was covered by warm and different shades of gold and looked like a bed of autumn leaves gently moved by the wind. It's hard to say exactly how many there were, but in the range of a few thousand. We were surrounded by them without seeing the edge of the school, and we could see many under the water surface too. I feel very fortunate I was there in the right place at the right time to experience nature at its best." 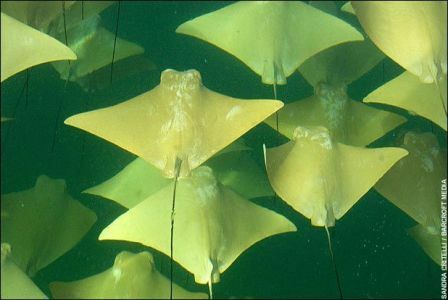 Measuring up to 7 feet (2.1 meters) from wing-tip to wing-tip, Golden rays are also more prosaically known as cow nose rays.